Collection of all of the resources related to 2017 Special Olympics World Winter Games in Austria. Content that provides a general overview of the 2017 Special Olympics World Winter Games in Austria. 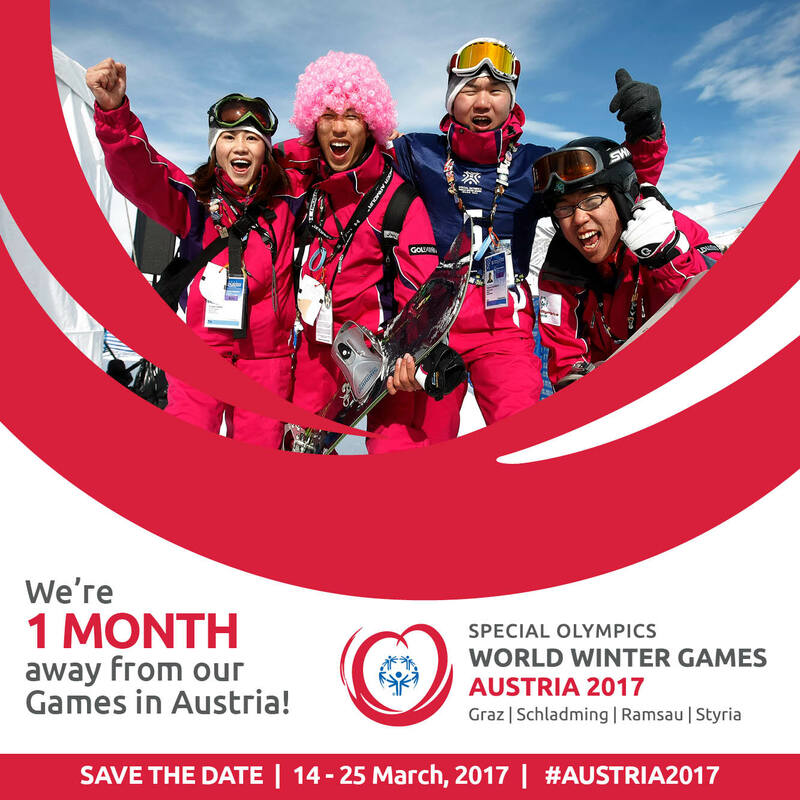 Austria 2017 Website: Visit the official website of the 2017 Special Olympics World Winter Games, scheduled for 14 to 25 March 2017 in Austria. Austria 2017 Overview on Special Olympics website: This page on www.specialolympics.org has introductory text, photos and a list of the latest stories related to the Austria 2017 Games. World Games Fact Sheet: A fact sheet that describes World Winter Games 2017. Messaging and Talking Points: A detailed description of Special Olympics World Games messages that can be used in a variety of circumstances. Special Olympics Healthy Athlete Overview: Learn about the Special Olympics Healthy Athletes® global health program, made possible by the Golisano Foundation. Healthy Athletes is the largest global public health organization dedicated to serving people with intellectual disabilities. Logo Usage Guidelines in English: An overview of the requirements of the Special Olympics logo usage for the World Games. All logo files referenced in these guidelines can be retrieved from the "Austria 2017 Logo and Delegation Customization" ZIP file. Austria 2017 Logos: Various file formats and arrangements of the logo. Austria 2017 Logo and Delegation Customization Bundle: A ZIP file that includes templates (EPS, AI and PDF versions) for delegations to use the official Austria 2017 logo co-branded with the logo of your Program. Austria 2017 Brochure: An overview of the vision, the data and facts, the venues and the goals of the Austria 2017 games. Branded Sample Power Point: This is a Microsoft PowerPoint presentation template to be used to create branded presentations for sponsors, media, partners, etc. Austria 2017 Email Tag: Insert this email tag at the end of your email signature to support the Special Olympics World Winter Games. Austria 2017 Flickr Site: Collection of photos related Austria 2017 Games. Video Message from Tim Shriver: Share this video by Special Olympics Chairman Tim Shriver with media and partners to encourage promotion and attendance of the Games. 2017 World Winter Games Promo: This 40-second video – which features English language text -- can be used to promote the 2017 Special Olympics World Winter Games. Austria 2017 Videos on Youtube: This playlist includes more promo videos and video stories about just a few of the 2,700 athletes going to Austria. Winter Games Athlete Stories: Stories of our athletes from all 7 Regions around the world. Social Media Guidance: Recommended social media language to be used to promote activation around the Games. Includes language for Twitter, Facebook and Instagram. Social Media Kit: Provides all of the information you’ll need to use your social media channels to amplify engagement and awareness of the Special Olympics World Winter Games Austria 2017. Activation Ideas for Programs: This guide suggests ways to promote content for World Games messaging and awareness at the local level. Facebook Cover Image: Cover design for your Facebook page to promote the 2017 World Winter Games. Instagram Photo: Photos for Instagram that you can use to promote the 2017 World Winter Games. Twitter Promo Photos: Photos for Twitter that you can use to promote the World Games. 2017 World Games Opening Ceremony Tune-in : Use this set of graphics to promote tune-in alerts for the ESPN broadcast of the Opening Ceremony in all social media.